There are certain voicebox conditions that naturally tends to a weak sounding voice. For some, the voice is weak all the time sounding breathy or just lacks projection. For others, the voice starts out OK, but than becomes weak after talking for some period of time. There are both pathological (ie, vocal cord paralysis) as well as functional (ie, muscle tension dysphonia) causes of a weak voice, but in the end, a patient just wants a better sounding voice one way or another. Although voice therapy is a standard way of addressing vocal weakness regardless of causation as well as possible surgical interventions, patients still need to use their voice and in order to obtain an immediately improved vocal strength is to use electronic amplification. For the same reason a pop star singer uses a microphone to amplify their voice to be heard in a gigantic stadium, a person with a weak voice can use a similar system to amplify their voice in more mundane situations. In essence, such personal voice amplification systems contain 2 components: microphone and speaker. 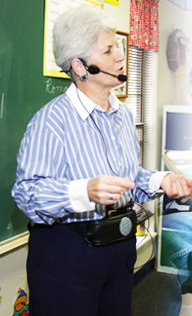 The microphone is placed near the mouth and the speaker placed near the person, typically on a belt. Such systems are relatively cheap costing less than $100. Many models can be found on Amazon.com at a discount. 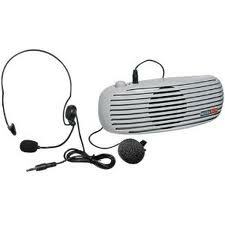 The "premium" voice amplification systems are by Chattervox and cost several hundred dollars.